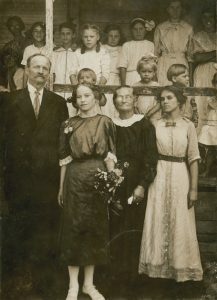 Front: Arthur Smith Claiborne (the 1st), his daughter Gertrude (Trudy) Claiborne, his wife Martha Jane (Hale) Claiborne, and another unknown daughter. Those in the back rows have not been identified. A story passed down through his descendants is that when Smith was a child during the Civil War, he would hide the family white mare in a cane field every day and put a sack around her muzzle so that she would not be stolen by the armies; Union soldiers took all of the horses except this one on the farm because it was hidden. [Email from Dr. Nancy Claiborne, one of Smith’s descendants, to Joshua Andrew Claybourn, March 2007.] Thus, the family had one horse with which to farm after the war. Smith settled near Lonoke, Arkansas, and on 2 December 1869 he married Martha Jane Hale. Martha Jane was born on 17 January 1852 in Mississippi as the oldest child to Francis Marion and Louisa (White) Hale. Martha Jane’s parents had moved to Arkansas in 1859. Her father Francis was born on 25 July 1828 to Andrew W. Hale and Sarah Smith. Andrew’s date of birth is unknown but his date of death was 5 August 1847. It has been suggested that Andrew may be related to Nathan Hale of the Revolutionary War, but this has not been confirmed. The birth date of Francis’s mother, Sarah Smith, is unknown but we do know that she died on 5 August 1852. Sarah Smith’s mother’s name was Sally and her father’s name was Zachariah Smith. The birth date and date of death of Sally and Zachariah is unknown. Zachariah’s father was Peter Smith, and the date of his birth and death are unknown. There is no mention of Zachariah’s mother’s name. Francis Marion Hale enlisted in the Confederate Army on 24 June 1862 soon after the battle of Shiloh. Francis was 38 years old at the time he fought in Company A of the 36th Arkansas Infantry Regiment and was detailed to special duty on 31 July 1862. Thereafter Francis was never seen or heard from again. He was likely killed while on duty and never identified. In January of 1863 Francis was presumed dead. Martha Jane’s mother, Louisa White, was born on 3 March 1834 and died on 17 May 1900. After Francis was declared dead Louisa remarried and had two more children. Louisa’s mother was Sara Jane; her date of birth and date of death is unknown. Her father’s name was S. C. White, born on 25 December 1809, and died on 8 August 1876. His obituary states that he and Martha had 13 children, 4 boys and 9 girls, and that Martha Jane Claiborne died 8 years before her husband. When Smith Claiborne died he had 29 grandchildren and 33 great grandchildren. Elnora Frances Claiborne was born on 7 October 1870 in White County, Arkansas. 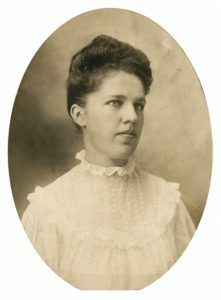 She married William (“Willie”) Clay Thompson on 4 March 1894. Willie was born on 4 March 1874;[World War I Selective Service System Draft Registration Cards, 1917-1918, Pulaski County, Arkansas, accessed through Ancestry.com.] his mother hailed from Arkansas but his father was from Indiana. [1900 United States Census, Garner, White County, Arkansas, accessed through Ancestry.com.] The couple was still living in White County during the 1900 census with their children Lester (five years old) and Mattie (three years old).[Ibid.] But by about 1917 they were living in Little Rock, Pulaski County, Arkansas, and appear to have remained there the rest of their lives. Elnora’s father, Arthur Smith, died at their home in Little Rock in 1936. Willie worked as a locomotive engineer on steam railroads through the 1940 census and the 1944 Little Rock city directory. His World War I draft registration said he had no physical disabilities, but at some point he lost his fingers in a cotton gin accident. Elnora died on 4 June 1944 in Pulaski County, Arkansas, and Willie followed over a decade later on 6 August 1957. 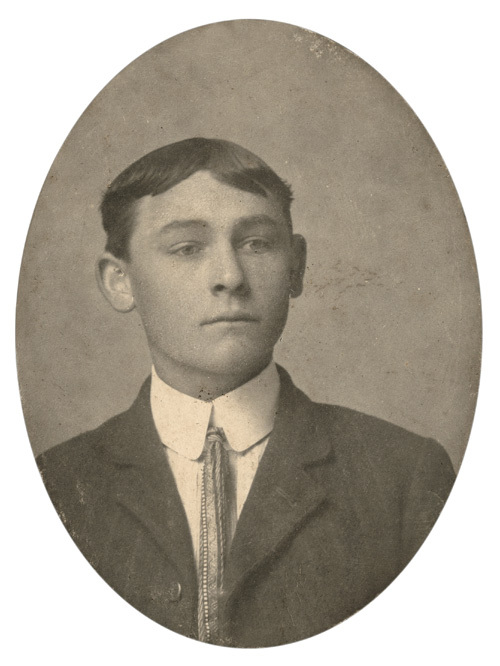 Leslie Charles Thompson was born on 14 October 1894 in White County, Arkansas. He married Floy Teresa (1899-1987) in about 1920. Leslie died on 11 September 1976 in Bend, Oregon. Margie Floy Thompson was born in about 1922 in Arkansas. She married John E. Barton Jr. (born in about 1920) in July 1942 in Pulaski County, Arkansas. Carrie Evelyn Fisher was born on 1 July 1920 in Pulaski County, Arkansas. She married L. B. 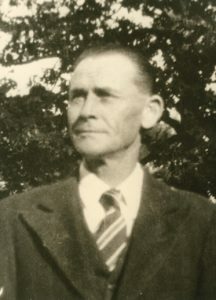 Wade Anderson (1918-1998) on 18 December 1936. Carrie died on 19 April 2002 in Geary County, Kansas. Gordon E. Fisher was born on 8 July 1923 in Pulaski County, Arkansas. He would have at least one son named James Fisher. Mary V. Fisher was born in about 1924 in Pulaski County, Arkansas. James R. Fisher, Jr. was born on 14 January 1927 in Pulaski County, Arkansas, died on 5 February 1987 in San Francisco County, California. An infant Thompson was born in about 1898 and died in about 1898 in White County, Arkansas. Mary Louise Thompson was born 7 October 1904 in Arkansas. She married Donald William Haragan (1904-1969) in about 1925. They lived in Little Rock, Arkansas, until 1935, then moved to Harris County, Texas, for the rest of their lives. Mary died there on 13 April 2000. Donald Robert Haragan was born in 1936 in Harris County, Texas. He married Willie May Oberry (born in 1939) on 2 July 1966 in Travis County, Texas. William Britton Claiborne (click name for separate biographical sketch) was born on 20 August 1872 and died on 11 January 1946. James Marion Claiborne (“Jim”) was born on 25 July 1874 in Arkansas. [1900 United States Census, Garner, White County, Arkansas, accessed through Ancestry.com.] He lived in the McRae and Beebe vicinity and worked as a farmer. [In various census records, including the 1900 United States Census, he is listed as a farmer.] He married on 22 November 1895 in White County, Arkansas, to Margaret (“Maggie”) Rogers (born on 4 February 1880 in Arkansas). [Maggie was one of at least eight children born to Robert F. Rogers and Mary D. Rogers. See 1880 United States Census, Cauthron, Logan County, Arkansas.] Jim died on 29 March 1956 at the age of eighty-one, and Maggie followed some years later on 10 March 1962. Bessie L. Claiborne was born on 23 August 1897 and died in 1900 prior to the June 4 census, both in White County, Arkansas. Elmer Reece Claiborne was born on 3 October 1900 in White County, Arkansas. He married Mary Edwards (1902-1983) on 27 March 1924. Elmer died in July 1987 in Streator, LaSalle County, Illinois. Glenn E. Claiborne was born on 16 May 1926 in LaSalle County, Illinois, and died there on 25 September 1994. Elmer Claiborne was born on 4 April 1928 in LaSalle County, Illinois, and died on 26 July 1993 in Glen Ellyn, DuPage County, Illinois. Martha Claiborne was born and died in 1902. Dorothy Marie Kirkland was born on 24 May 1938 in White County, Arkansas. She married Harrel O. L. Wilson (1926-2008) on 21 September 1947 in White County. Dorothy died on 21 January 2013 in White County. Erma C. Claiborne was born in 1907 and died in 1909 in White County, Arkansas. Ollie Claiborne was born in about 1909 in White County, Arkansas, and died after the 1920 census. Hattie M. Claiborne was born in about 1911 in White County, Arkansas. She married Elmo P. Thompson (1909-1963) of Greene County, Arkansas, on 24 February 1930 in White County. She died on 29 June 1930 in Pulaski County, Arkansas. Elmo married again and moved to Huntington, Cabell County, West Virginia, in about 1938 where he worked as their chief water system engineer until his death. William Adicus Claiborne was born on 18 May 1914. He married Leoda Coleman (1914-2003) on 1 January 1939. She is buried at Lebanon Cemetery in McRae, Arkansas. Thereafter William lived with his son Charles in Bartlett, Tennessee. Jerry Wayne Claiborne is in the 1963 University of Arkansas yearbook with an estimated birth date of 1943. He moved to Florida in 2013. Charles Henry Claiborne is a 1964 graduate of North Little Rock High School with an estimated birth year of 1946. He then enrolled at Hendrix College in Conway, Arkansas, for a few years, and graduated from the University of Arkansas. He worked for Arthur Anderson and then, in 1983, went to work for Boyle Investment Company. He eventually rose to the position of chief financial officer and treasurer. Karen Claiborne was the third child born. She lived for a time in Texas. Jim Lee Claiborne was born on 24 January 1919 in White County, Arkansas. He married Dessie Lorene Stark (1921-1983) of Arkansas who died and was buried in Sacramento County, California. Jim died on 5 November 2000 in White County and is buried with his wife in Mount Vernon Memorial Park Cemetery. Dewey Vernon Claiborne was born on 7 September 1922 in White County, Arkansas. He married on 24 December 1947 in Mecklenburg County, North Carolina, to Martha Ann Starrett of Arkansas (born in 1922) and they had a daughter, Deborah Ann Claiborne. Dewey served as a pilot in the United States Army Air Corps during World War II and died on 23 September 2010 in Jefferson City, Missouri. Mattie Melvina J. Claiborne was born on 6 October 1876, but died roughly one year later on 20 August 1877. She is buried in the Cheek-Vinity Cemetery near her sister Mattie Jane Claiborne. William Bunyon Liles was born on 29 September 1902 in White County, Arkansas. He married Blanche Iris Price (1903-1982) on 20 June 1920 in White County, Arkansas. William died on 27 August 1965. Rubert D. Liles was born on 28 October 1921 in White County, Arkansas. According to his headstone, he served in the U.S. Army during World War II. Rubert died on 3 March 1985 in Beebe, Arkansas. Annie Bell Liles was born in about 1940 in White County, Arkansas. Blanche Hettie Liles was born on 2 March 1904 in White County, Arkansas, where she lived her entire life. She married William Louis “Bill” Harrell (1904-1991) on 24 December 1920. Blanche died there on 12 December 1961 and is buried at Antioch Cemetery in White County. Hubert Louis Harrell was born on 31 October 1921 in White County, Arkansas. He married Alma Juanita Choate (1922-1988) on 9 February 1941 in White County and served as “TEC5 850 ENGR AVN BN” in World War II. Hubert died on 7 June 1958 in Searcy, Arkansas. Elvada Harrell was born in 1924 in White County, Arkansas. She married first to Elvis Lamar Carter (1919-1944) on 9 August 1941 in White County. He was declared missing in action shortly after D-Day. She married second to Orell Bennett (1921-2000) on 10 April 1947 in Saline County, Arkansas, then third to Vard L. Gunn (1911-1987) in about 1952. Nelson Jack Harrell was born on 18 February 1926 in White County, Arkansas. He served in the U.S. Army from June 1944 to February 1947. Nelson married first to Lorene Downing on 29 March 1945 in White County and second to Eva Mary Worm. Nelson died on 13 January 2006 in Conway, Arkansas. Glen E. Walker Harrell was born on 7 February 1928 in White County, Arkansas. He married Hope Dean Taylor on 14 August 1946 in White County. Glen died on 29 November 1991 in White County. Elvis Willard Harrell was born on 25 February 1930 in White County, Arkansas. He married Dana Ree Smith (1931-1997). He was taught to love music by his mother and was a lover of gospel music for many years. He pastored a church from the summer of 1963 until his retirement in the fall of 1975. Elvis died on 28 May 2013 in Conway, Arkansas. Cleveland Harrell was born on 8 November 1932 in White County, Arkansas. He was a specialist 3rd class in the U.S. Army during the Korean War. Cleveland died on 22 November 1994 in Ashley County, Arkansas. Curtis D. Harrell was born in about 1936 in White County, Arkansas. Wayland Harrell was born in about 1938 in White County, Arkansas. Yvonne Harrell was born in about 1941 and married James Southard. Arthur Thomas Liles was born on 19 June 1906 in White County, Arkansas. He married Mary Ila Garner (1906-2003) on 7 November 1925 in White County. Arthur died on 24 August 1970 in Arkansas. Zorah Annie “Zoe” Liles was born on 15 May 1914 in White County, Arkansas. She married Manuel Floyd Harlan (1910-1993) on 26 January 1935 in White County. Zoe died 24 April 1993 in Beebe, Arkansas. Carmel Liles was born on 23 January 1921 in White County, Arkansas. She married Victor Owen Washburn (1916-2001) on 24 October 1939 in Pulaski County, Arkansas. Carmel died on 27 November 2006 in Pulaski County. Martha Claiborne (“Mattie Jane”) was born on 30 November 1880 and died on 21 July 1882. Mattie Jane and her sister Mattie Melvina are both buried in Cheek-Vinity Cemetery. The headstones had both been broken off and were propped up against a tree. Alcora Love Claiborne was born on 28 March 1882 and married Edwin Morris Edwards (1876-1946) on 12 October 1902 in White County, Arkansas. They had two children listed below. In the 1930 census Alcora is listed as widowed, which probably means divorced, and she died on 31 October 1934 in White County. Dewey Curtis Edwards was born on 13 February 1906 in White County, Arkansas. Dewey died on 4 March 1988 in Garland, Texas. He married Marion Elizabeth Honea (1911-1989) in about 1927. Dewey Curtis Edwards II was born on 16 November 1928 in Harris County, Texas. He married Judy Thompson Munroe (1933-1989) in 1949 in Bexar County, Texas. In about 1960 the couple and their three young children were establishing an Episcopal mission in the remote Yukon, Alaska. By 1961, Dewey and the children died there, while his wife survived. Patricia Ruth Edwards was born on 1 Decemeber 1930 in Bell County, Texas. She married Herman Ernest Richarz Jr. (1930-2013) on 24 December 1950 in Harris County, Texas. They had three children. Patricia died on 24 March 2015 in Bell County. Paul Edwards was born on 30 September 1910 in White County, Arkansas. He married Thelma A. Mashburn (1915-1981) on 22 August 1934 in White County. Paul died on 29 April 1976 in Pulaski County, Arkansas. Patricia Ann Edwards was born in about 1936 in Pulaski County, Arkansas. Barbara Jean Edwards was born in about 1938 in Pulaski County, Arkansas. Arthur Smith Claiborne (2nd) as a young man. Minnie (King) Claiborne as a young women. Arthur Smith Claiborne (2nd) near the end of his life. Victor Claybourn and Harriette Threlkeld visited Arthur one evening in McRae in October 1959. It was, as far as was known, the only contact between the Illinois and Arkansas branches of the family in 93 years. They said they were cordially received and noted Arthur’s physical resemblance to other members of the clan. He had just completed and moved into a beautiful brick home with large oak trees in front, built on the spot where about 30 years ago his home burned (after which he moved to the farm) and with it a trunk of his father’s containing family records. Mildred Kathlyen Claiborne was born on 19 July 1910 and died on 2 August 1925 at the age of 15 in an automobile accident. Mary Lynn Claiborne was born on 9 March 1937 and worked for a time as the Recorder/Treasurer for city of McRae, Arkansas. Odis Glen “Bud” Claiborne was born on 28 June 1940 in White County, Arkansas. He was a graduate of McRae High School and attended Arkansas State University. He worked for Danco Construction in North Little Rock for over forty-six years and was well known and highly respected in the utility construction business. He was an avid hunter and fisherman and one of his greatest joys was teaching his grandsons how “to catch the Big One.” Bud died on 2 December 2010 in White County and was survived by his wife Vivian. Harry Eugene Claiborne (2 July 1917 – 19 January 2004): Click name for separate biographical sketch. Mirl Jenkins was born on 22 February 1908 in Shawnee, Oklahoma. He married Mabel Clara Hawkins (1900-1997) on 22 July 1935 in White County, Arkansas. She had previously married Granville Pate (1892-1973) on 15 June 1918 in Texas and had two children, Eva Louise Pate (born in 1920) and Jimmie Dale Pate (1922-1939), but no children with Mirl. Mirl died on 22 December 1995 in Austin, Texas. Addie Lavern Jenkins was born on 15 February 1910 in White County, Arkansas. She married Marvin Grissom Sappington (1902-1987) on 17 May 1933 in White County. Addie died on 4 September 1992 in Kaufman County, Texas. Clarence Holland “Pete” Jenkins was born on 3 March 1915 in White County, Arkansas. He married on 4 September 1936 to his brother’s step-daughter, Eva Louise Pate (born in 1920). Pete died on 17 April 1981 in Austin, Texas. Nancy Dale Jenkins was born in 1939 in Harris County, Texas. Caroline Ann Jenkins was born in 1945 in Harris County, Texas. Jimmie Francis Jenkins was born in 1949 in Harris County, Texas. Vernon Ralph Jenkins was born on 23 December 1917 and died on 11 February 1918, both in White County, Arkansas. Bernice Clarence Jenkins (pronounced “Burnis”) was born on 20 September 1925 in White County, Arkansas, and died on 6 September 1976. Sarah Kathrine Claiborne Gammill was born on 15 February 1890 and died on 26 September 1975 (click name for separate biographical sketch). Kineth C. Claiborne was born on 14 November 1892 and died on 16 November 1892. Kineth is buried in Lebanon Cemetery in White County, Arkansas. Mary Ella Claiborne was born on 22 October 1894 and died on 30 October 1898, both in White County, Arkansas. Ethel Gertrude Claiborne (“Trudy”) was born on 4 February 1898 and died on 11 September 1917 of tuberculosis. She is buried in Lebanon Cemetery.